Introduction-Digital Pictures Recovery Software rescues digital files disaster due to formatted disk, corrupted removable media, virus attack, system fault, device resetting, improper usage and other similar causes of data loss.If you have accidentally deleted or lost your memorable digital pictures from your computer system and data storage removable media then you can get back lost data by using Data Doctor’s Digital Picture Recovery Software which recovers all your lost digital photos in easiest way. Digital image recovery tool restores missing data (like digital pictures, images, snap shots, photos, webshots) even if removable device is not recognized while device is accessed in My Computer. Digital photo retrieval software is an inexpensive data recovery utility to revive lost data from all major hard disk and removable media drives including digital camera and external mobile communicator. Cost effective and user friendly GUI interface tool facilitates with in built help menu, and also easy to use for technical and non technical users. Where Does Digital Pictures Recovery Software Work? Restore lost, missing or deleted digital pictures, images, webshots, photos easily. Revive invalid files/folders from data disaster after virus attack, formatted drive, software malfunctioning and other similar data loss. 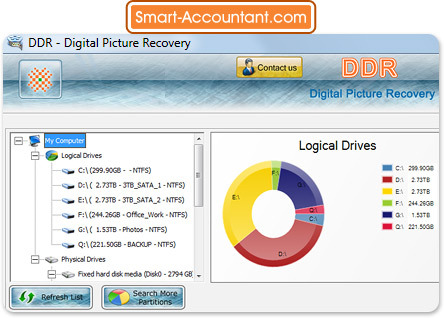 Retrieve all type of digital image files such as JPEG, JPG, GIF etc. Support all type of digital cameras, memory card devices and hard disk drives. Facilitate to preview recovered files and folders. Simple and reliable tool does not require any special skill to operate. Facilitate with user guide for easily understanding by technical and non technical users. Provide highly interactive user friendly wizard interface.